Slugs belong to the large animal group called gastropods that have diversified to colonize most habitats on the planet; from wood­lands to deserts, and from high mountains to the deepest rivers. Slugs can be very damaging pests in moist, shady gardens. They feed on the leaves of many plants, especially seedlings. Later in the season they can feed on ripening fruits and vegetables. Slugs are especially numerous during rainy seasons and in well-irrigated gardens. Most species of slugs are generalists, feeding on a broad spectrum of organic materials, including leaves from living plants, lichens, mushrooms, and even carrion. Some slugs are predators and eat other slugs and snails, or earthworms. Slugs are best described as snails without shells. Slugs are soft bodied, generally brownish or grayish, with eye stalks. They vary in size from 1/4 inch to two inches or longer. Slugs leave a silvery slime trail that they secrete (mucus) as they move. This mucus is also used as the slugs navigation system, as slugs will find their way back to their tunnels and feeding sites by following their mucus trail. A slug has two retractable pairs of tentacles. The upper pair of tentacles are called the optical tentacles and are the eyes of a slug. The optical tentacles have light sensitive eyespots on the end and can be re-grown if lost. These are also used for smell. The lower pair are two smaller tentacles and are used for feeling and tasting. The mouth parts are below the tentacles and the slugs eat using a radula which is a tongue-like organ that is covered with approximately 27,000 tiny tooth-like protrusions that are called denticles. 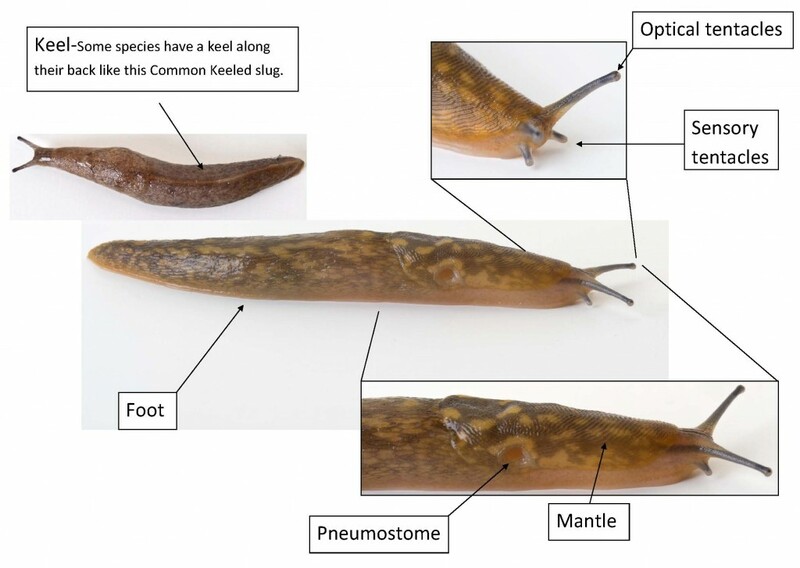 Slugs have a large respiratory pore called the pneumostome. This leads to a single lung and is generally found on the right hand side. The mantle is an area behind the head of the slug and is made of thicker flesh than the head. If a slug is frightened or not active the slug will retract its head into the mantle for protection. The mantle also forms the respiratory cavity. The keel is a ridge that runs the length of the back of some species of slug. Most slugs live underground and the ones that can be seen feeding above ground are only approximately 5% of the total slug population. Cool weather, rain and fog is the best weather for slugs because since they don’t have an outer shell to protect them, they may dry out in dry and warm weather. When the weather is warm and dry slugs will try and find a cool, dark and damp area to hide in. However if there is a long dry spell then slugs will encase themselves in a papery cocoon-like structure and attach themselves to a wall or a tree and wait it out. Most species of slugs are herbivores however some are carnivores and the diet of a slug varies depending on what species it is. For more information about a certain species’ diet see the Identification guide. When a slug is attacked by a predator it will contract its body to make it a smaller target. The mucus that covers a slug’s body doesn’t taste very nice and is slippery, so this is why you will often see birds wiping slugs on the grass before they eat them. 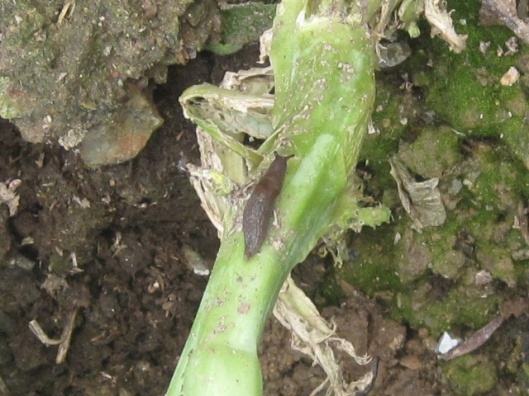 Slugs do most of their damage at night and on wet, cloudy days. They are most active throughout the spring, early summer and again after autumn rains begin. In warm and wet climates slugs and snails can be active all year. During the day they hide in dark, moist sites under decaying leaves, low growing plants, dirt clods, pots or debris. Slugs are also quite capable of burrowing into the soil by following decayed plant roots, cracks, worm tunnels and along boards surrounding raised beds. These pests are also excellent climbers and can be seen quite high in plants. Snails in particular can seriously damage citrus trees. What Does Slug Damage Look Like? Large, ragged holes in tender leaves and flowers. Damage during the spring before many insects are active. Traces of silvery slime on chewed leaves or along the ground. Seedling leaves completely gone with only a small stem remaining. To manage the slugs’ problem, it is recommended to integrate different tactics. The National Plant Protection Centre recommends the following tactics. Eliminate, as much as possible, all places where slugs can hide during the day. Stones, piles of leaves, old nursery pots, weedy areas and low hanging leaves at the base of plants should be removed. Fine soil loaded with well broken-down organic matter is unattractive to slugs as it lacks the fine cracks in which to lay eggs. Mulching with sand or gravel is another method as it will provide rough surface for slugs to travel on and they will sometimes avoid it. Hand picking of slugs (early morning and if possible at night time) is more effective. Remember to use protective gloves to collect and destroy the slugs with salt. Allow your chickens and ducks into vegetable field as they will feed on slugs, insects and snails. Slugs and snails (class Gastropoda) are the obligate intermediate hosts the nematoded; rat lungworm (Angiostrongylus cantonensis). This nematode is the causative agent of human angiostrongyliasis and the most common cause of human eosinophilic meningoencephalitis. 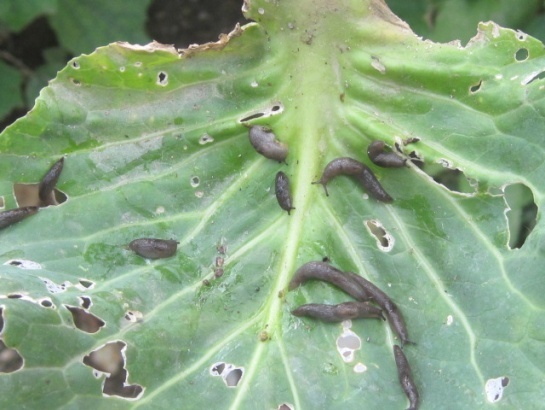 Humans can become infected by accidental consumption/ contact of slugs and possibly flatworms (or a portion of one of these animals) in fresh produce, but the slime from these animals can contain nematodes and may also constitute a disease risk. Therefore, it is recommended to use protective hand gloves / safety gears during collection and destruction of slugs.